Prepare yourself for the Milongas (dance halls) by mastering all three of the Argentine Trio: Tango, Milonga and Vals. No Tanguero is complete without dancing them all! The Milonga video/DVD offers you 14 figures ranging from beginner to advanced, perfect for the lively, fun and rhythmic Milonga music. All figures on this videos/DVDs are demonstrated as the Leader, as the Follower and together. The stage is large enough to show complete patterns. The camera work does not focus primarily on the dancers feet. 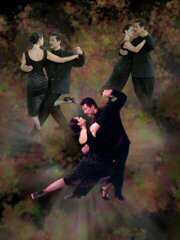 This provides an opportunity to see the upper body leading and following which is missing from many other tango videos and is actually the most important aspect.